Storytelling with Saris is a long-term interdisciplinary social practice project in collaboration with women from my ancestral village in Bangladesh, an island community threatened by climate change. The village is called Katakhali and is located on Barobaishdia Island, Patuakhali District, in the Bay of Bengal. 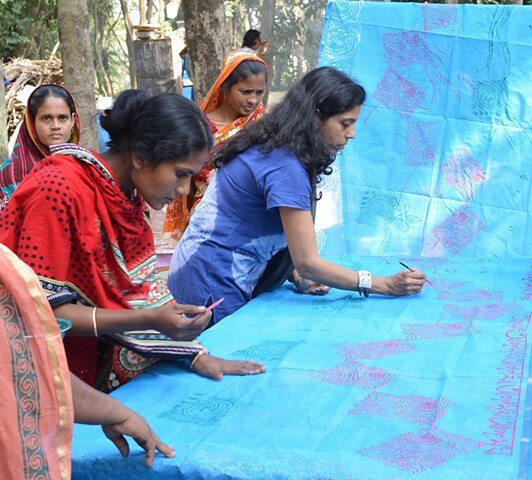 This art and advocacy project includes collaborative printmaking on saris, video and photography, writing, self-documentation in journals of the women’s lives, performance, and workshops and installations on climate change in the US and in Bangladesh. Storytelling with Saris creates a trans-border connection between individuals in the US and Bangladesh to confront the challenge of climate change. 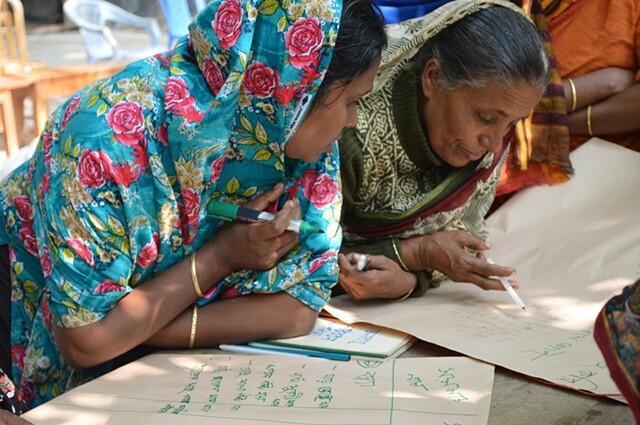 Instead of an abstract approach with facts and figures, Storytelling personalizes global warming by giving voice to affected women in Katakhali, Bangladesh. The project engages with and follows a dozen women in Katakhali over the course of years, tracing their lives as climate evolves. More details are found at http://storytellingwithsaris.com.